My husband LOVES chicken wings. He is always experimenting with a new chicken wings recipe and a new way of cooking them. He loves to cook chicken wings every which way- fried, baked, grilled, and in the crock pot. Most recently he has settled into a crock pot chicken wings routine because we like how it renders off so much of the fat and leaves the meat so tender, juicy, and easy to get off the bone. After we cook the chicken wings in the crock pot (aka slow cooker), we crisp them up in the oven for just a few minutes and they come out so perfect! Well naturally, when Carrot Krate, a local community supported agriculture CSA delivery service, asked me if I could come up with a chicken wings recipe featuring some local farms, I knew my husband was up for the challenge. We love supporting local small businesses. 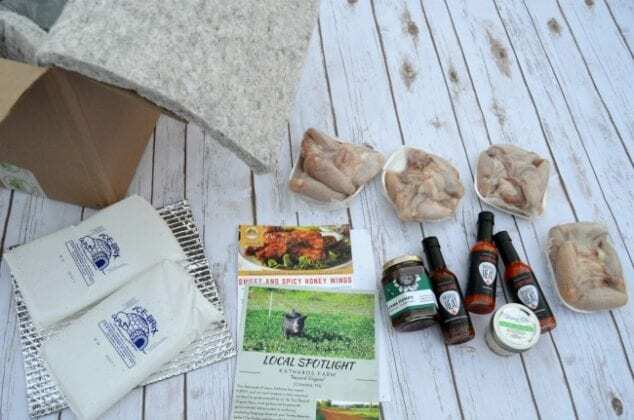 I unboxed my Carrot Krate which featured free- range chicken wings from Katharos Farm, Nashville Heat hot sauces, Williams Raw Honey, and Sriracha, Shallot, & Scallion Butter from The Chattanooga Butter Company. With these tasty ingredients for inspiration, it was super easy to come up with a crock pot chicken wings recipe. Here’s how to cook crock pot chicken wings and three different chicken wings sauces to use on crock pot hot wings from mild to spicy. We made three different sauces. If you just one to go with one, you will want to triple the recipe. 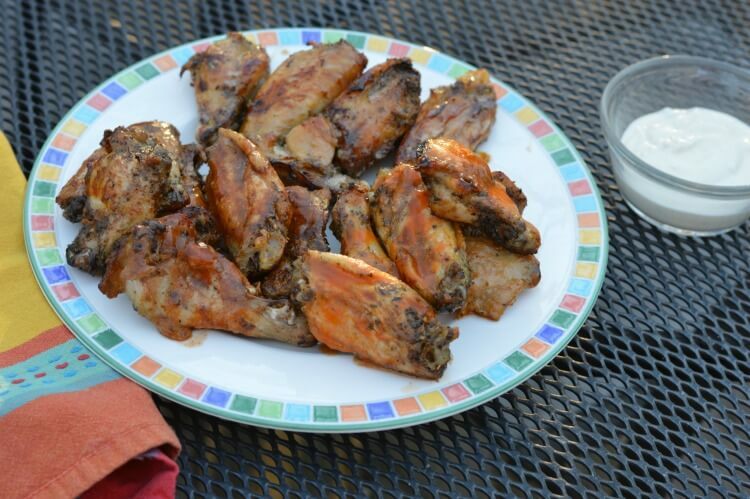 This crock pot chicken wings recipe is so easy! 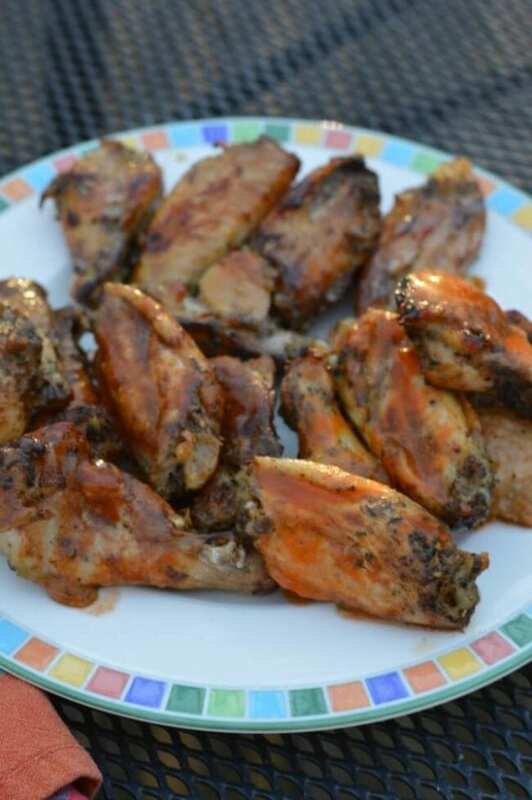 You will hardly believe how easy it is but the hot wings taste fantastic without much fuss. The first step is to take your wings and cut them up into the 3 pieces- the drumette, the flat, and the tip. 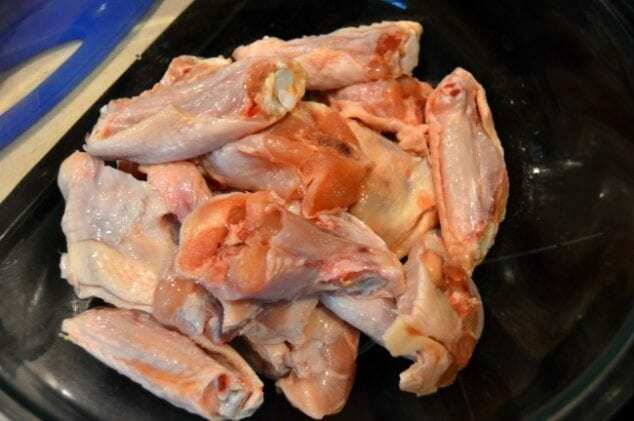 We don’t use the tips in this crock pot wings recipe but you can save those for your slow cooker chicken stock recipe. Next up, just toss the wings with the herbs and spices and dump them in the slow cooker and set it for 4 hours. When you pull the lid off 4 hours later, you will find that the fat has largely cooked right off the wings. 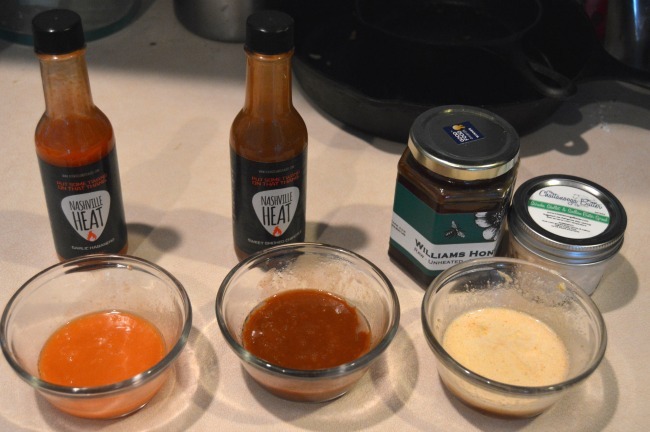 Mix up your simple wing hot sauces. Line a baking pan with aluminum foil to avoid a mess and you can also use it to create dividers between your slow cooker chicken wings so you can keep the sauced wings separate. 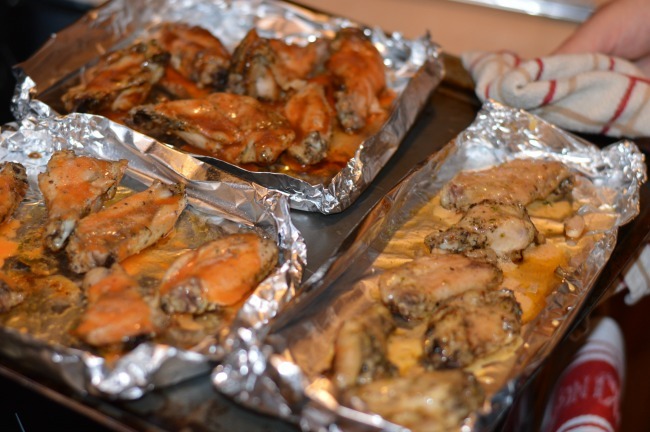 Use tongs to lay the crock pot wings out onto the baking sheet with space between each one. Then use a spoon to cover each wing in wing sauce. Place baking pan in oven about 10 inches down from the heat source and bake for 5 minutes. Pull out the baking pan and use tongs to flip over each wing. Then use a spoon to cover the second side in sauce. Place baking pan back in oven about 10 inches down from the heat source and bake for another 5 minutes. Now your crock pot chicken wings will be nice and crisped up and totally flavorful and delicious! You can pile them on a plate and serve with ranch and/or blue cheese dressing for dipping. These crockpot chicken wings are so good and so easy. The slow cook helps render off excess fat and then you can give them a quick crisp in the oven. Take your wings and cut them up into the 3 pieces- the drumette, the flat, and the tip. We don't use the tips in this recipe. Toss wing pieces with the chicken seasonings and dump them in the slow cooker and set it for 4 hours on the lowest setting. Before you remove your wings from the crock pot, mix up your simple wing hot sauce by mixing together the melted butter and hot sauce. 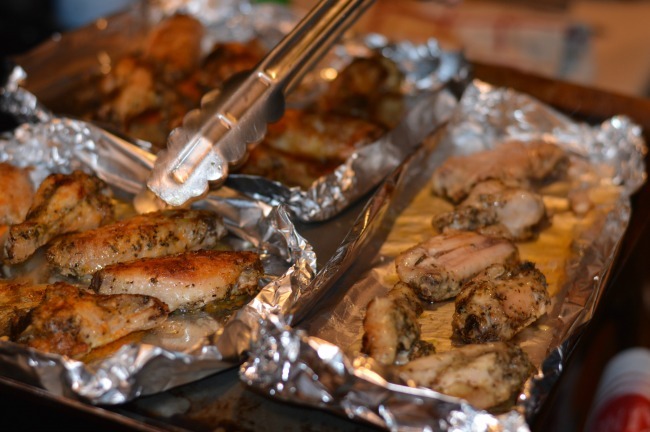 Line a baking pan with aluminum foil to avoid a mess. 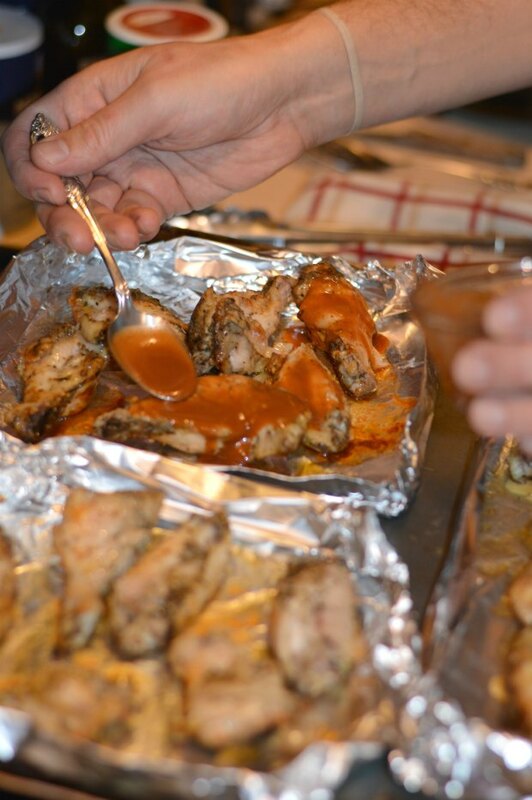 Pull out the baking pan and use tongs to flip over each wing and then use a spoon to cover the second side in sauce. Now your crock pot chicken wings will be nice and crisped up and totally flavorful and delicious and ready to serve! Which one of the hot wing sauce recipes catches your fancy? Have you ever tasted crock pot wings? 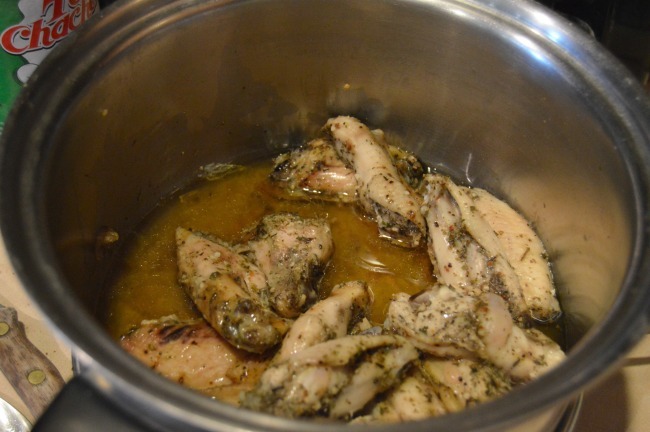 I hope you enjoy these crock pot chicken wings as much as my family does! 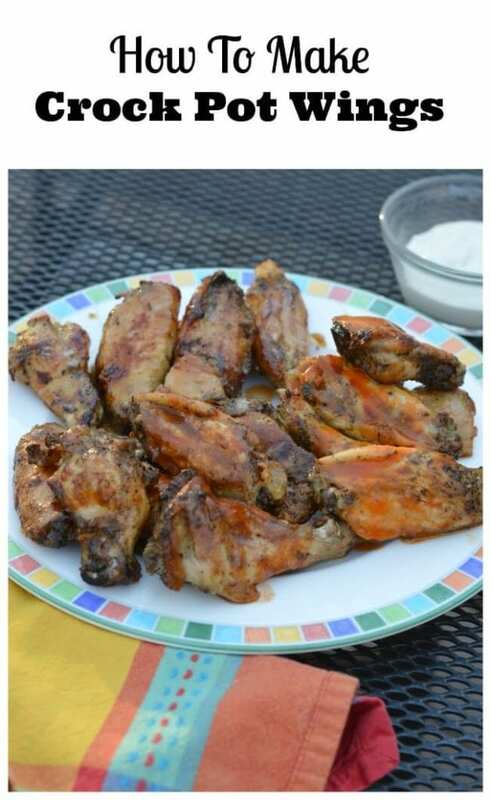 I love chicken wings too but I have never tried making them in the crock pot before! It sounds like a great idea though. I’m going to have to give your recipe and technique a try! These look perfect for the big game! I can’t wait to try your recipe! These chicken wings look absolutely delicious and perfect for hosting! Pinning for later 🙂 Thanks for a lovely recipe!